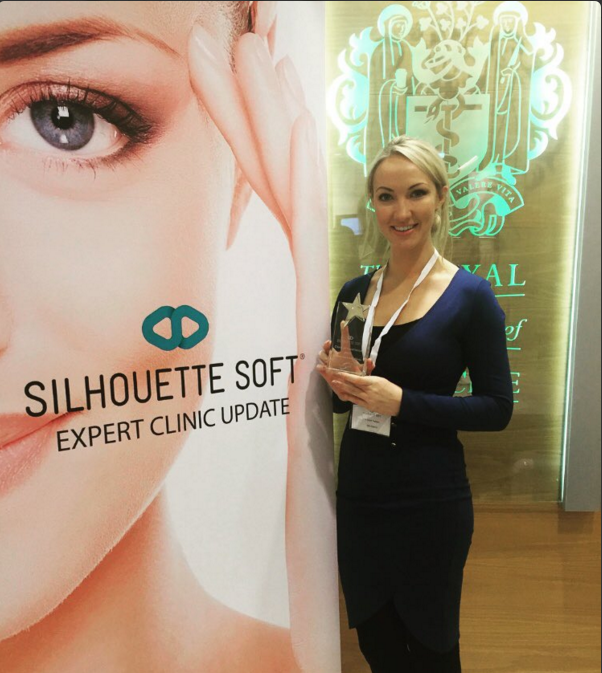 Here at the Dr Leah Clinic we are proud to congratulate our Director Dr Leah Totton on having won the top prize in the UK for excellence in Silhouette Soft Thread Lifts. This prestigious accolade was awarded based on medical excellence and skill and also means she has performed the most procedures in the UK with the best results. This procedure responds to people's desire for effective but subtle anti-ageing treatments that will put off or prevent the need for cosmetic surgery while combating sagging brow, jowls and neck and as such has become one of our most popular offerings at our Moorgate and Loughton clinic with two of Dr Leah’s very happy patients being reported in the Daily mail. The thread lift treatment takes approximately 1 hour to perform and involves pulling a thread under the skin of the jaw line and lower face and mechanically pulling it upwards, lifting the mid and lower face to improved sagging. The thread itself is made from Poly-Latic acid which over time naturally dissolves stimulating collagen production for additional long term anti-ageing benefits. Natural looking results will leave you with a more refreshed, rejuvenated and youthful appearance lasting approximately 18 months.